Water...Most of us take it for granted! Have you ever taken a moment to stop and think just how important water is to you? Without water nothing in your body would work properly. The human body can last weeks without food, but cannot survive longer than a week without water. 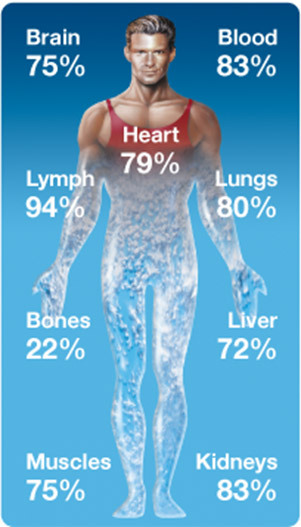 A huge amount of your body is made up of water making up 60% - 75% of your total body weight. Most of the water is contained inside our cells and our billions of cells must have water to live. All it takes is a 1% reduction in hydration levels to make you thirsty and at levels above 5% your muscles, strength and endurance become compromised. Above 10% and your health is at risk and finally at the 20% level will result in your death. Helps transport nutrients, oxygen in and out of cells. Water intake is very important when you are trying to reduce body fat. The most important organ in the human body when it comes to fat loss is the liver. It’s where fat metabolism takes place and water helps your body to metabolize stored body fat. This is how it works. Your kidneys need water to work efficiently. When your kidneys don't get enough water, they slow down. Your liver picks up the slack and helps to get rid of your body's waste. One of your livers primary function is to metabolize stored fat into energy, but now it is doing the work for your kidneys, therefore the fat remains stored in your body. You also need to have a properly functioning digestive system in order to burn fat effectively. You need water to cleanse the GI tract and remove metabolic waste. Without it, you will significantly diminish the ability of your digestive tract to assimilate nutrients and fuel your body. For fat oxidation to happen, oxygen must be present. Water is made up of oxygen. When you deliver oxygen to your cells it is more likely you are going to burn fat and the best way to deliver oxygen to the cells is through water intake. 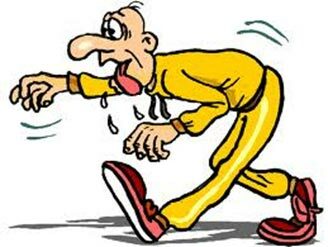 Even minimal dehydration (one percent body weight) can increase cardiovascular strain. Thus, water deficits increase the probability for compromising exercise performance. 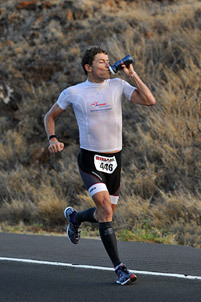 Properly hydration results in a better workout, which in turn would build some muscle. In return that muscle will burn more fat. Therefore, proper hydration before as well as after your workout session would improve the quality of your workout, reduce fatigue and reduce recovery time. The bottom line is that the importance of water is paramount in your health and fitness goals. If you want to build muscle, lose weight, burn fat or tone up, water is the primary tool to get it done. Many people think that drinking water causes water retention. In fact, the opposite is true. Drinking water helps the body rid itself of excess sodium, which results in less fluid retention. The body will retain fluid if there is too little water in the cells. If the body receives enough water on a regular basis, there will be no need for it to conserve water and this will reduce fluid retention. Dehydration occurs when the water content of the body is too low. Everyday the water is lost through urination, faeces, sweating and breathing. Since many of the processes within the body also rely greatly on water, it is important to replace the intake regularly. The effects of dehydration creep up slowly on you. By the time you feel the full impact, it’s too late, you are already dehydrated. If dehydration is not countered by fluid intake, eventually urination stops, the kidneys fail and the body can’t remove toxin waste products. In extreme cases, dehydration may result in death. If it’s not hot, you might not even link the symptoms to lack of water. But an easy way to gauge how well-hydrated you are is to simply look at our urine. It should be fairly clear, and if it is very dark yellow, that’s sign you may need to drink more water. If you are well hydrated, you should be urinating once every 1 ½ to 2 hours. Because your thirst response takes longer to tell your body it needs water, you should be in the habit of drinking water/fluids frequently throughout the day. Did you know that drinking too much water can also damage the body and cause ‘water intoxication’ also known as ‘hyponatremia’? Hyponatremia occurs when large amount of water is consumed in a short period of time and this excess water accumulates in the body at a higher rate than it can be excreted by the kidneys. When this happens there is a disturbance of salts in the blood in which the sodium concentration in the blood gets lower than normal. Sodium is an electrolyte, which helps regulate the amount of water that is in and around your cells. Water intoxication can lead to headaches, nausea, slurred speech, disorientation, blurred vision, cramps (and eventually convulsions), coma and possibly death. Endurance athletes such as marathon runners during strenuous exercise drink large amounts of water without adequate replacement of sodium (lost along with sweat) are at a higher risk of hyponatremia. Prolonged and excessive sweating increases the risk as it alters the delicate balance of blood-sodium concentration. Because sodium is lost in sweat it is important for those exercising at high intensities for long periods of time to replace any loses. At the first sign of symptoms an athlete should drink a sodium containing drink and eat salty foods. Hyponatremia Is RARE in the general population….for water to reach toxin levels, you would have to consume many liters in a short period of time. We hear all the time that we should drink eight 8-ounce glasses of water per day. There is no good scientific studies or evidence to support the Eight-by-Eight rule. The Institute of Medicine has set general guidelines for total fluid intake. From both food and beverages, women should consume around 91 ounces (about 2.7 liters) of total water daily. 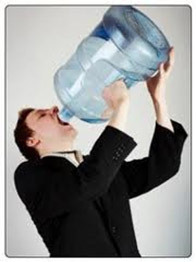 For men, it is around 125 ounces (about 3.7 liters) of total water daily. Depending on your diet, about 25% of the water you consume comes from your food. As a basic principle water intake should be customized also like other macronutrients depending on many factors including your health status, your weight, the climate you live in, activity level, if on a high protein diet during training, etc.